How automated raffles on scrap.tf work. How do I know when I have won a raffle? You will get a notification and a red banner at the top of the page when you have won a raffle. It keeps saying that there are no active public raffles! Then, as the text says, there are no raffles available at this moment. You will have to wait until someone makes a new/another one in order to see it and join. How do I get/claim my prize? When you win and click on the red notification, you should be redirected to a page with the raffles that you won. It should look like the image below : You will have to click on the "Withdraw items" button in order to get put in the queue and claim your prize, a bot will send you a trade offer when it's your turn. Please, before accepting the trade, make sure that the items are the correct ones. Is there a claiming time limit? I was claiming my prize and the trade errored and now I can't claim it! You will have to wait for some minutes so the bot notices that you have not withdrawn your prize and try again. If the issue persists and you are unable to withdraw it again, you will have to submit a refund request in the refunds subforum or if the trade keeps erroring, you will have to submit a support ticket in the help and support subforum. How do I use the steam/custom emotes? In order to use the steam or the custom emotes that we offer, you will have to write :nameoftheemotehere:. The emote (picture) will appear once you post the comment. I am unable to join group raffles! Make sure that every setting in your privacy settings is set to public, that you are really in such group(s), and that you have tried logging off and logging in from our site. 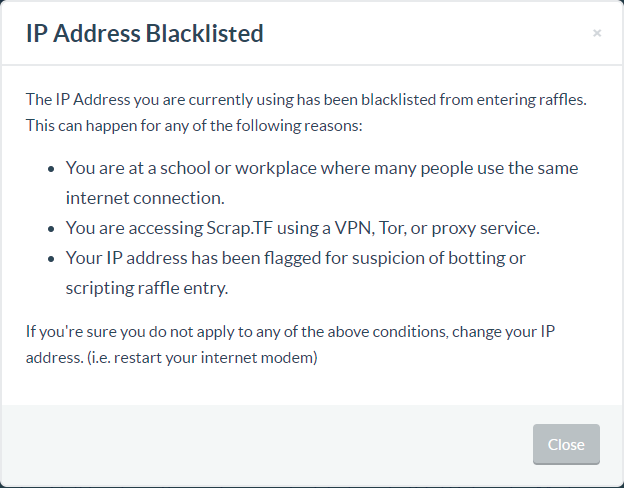 It's saying that my IP has been blacklisted!? There are a lot of people in the same place that you are which are using scrap.tf. You are accessing Scrap.TF with the web browser Tor, VPN or proxy service. Your IP has been flagged for suspicious behavior. If you are sure that everything is fine and you are not doing anything which was stated previously, then you will have to change your IP address. Restarting your router should do. It keeps saying that the raffles are ending soon! That tends to be an issue in your end and not ours. Please, make sure that your computer or device that you are using for accessing our site has the right date and the right time as it might be outdated or set to another time for some reason. Can I raffle more items than I am allowed to? Yes, you can. You can increase your raffle items limit by purchasing premium. 250 for Premium Plus users. 300 for Super Premium users. Where is the enter raffle button? The raffle might have ended or still is being validated. Refresh the page to see if the information about the raffle got updated. It keeps saying that I am using alts and that it has been recorded! The meaning of that message is that someone else has/shares the same IP as the one that you have, this exists to prevent people from cheating by making alts. You won't get banned for that, you just cannot enter the same raffle as someone else on your IP already has. Please make sure to read the stickied guidelines on IP whitelisting in the forum! Tips are a way of showing a user gratitude for a raffle. Tips can be given by going to a raffle created by the user and clicking the 'Tip User' button. In order to give users tips, you must either earn them from raffles or buy them. Tips are exchanged at a rate of 1 Scrap for 1 Tip. When you have earned tips, you can redeem them at the same 1 Scrap for 1 Tip rate. What do these colored circles with numbers mean on raffle items? The colored and numbered circles indicate winner groups for multiple items. A raffle can have a total of six different winner groups, this means that you can win all items of the same group (color/number). Whenever I try to submit a raffle it says "Unable to load your inventory." When submitting a raffle we must load your inventory from Steam to ensure that you're submitting valid items. This error means that the Steam API is undergoing some stress; you can try again in a few moments, or later. What does it mean that I've hit my limit in a raffle? Because bot space is precious, you may only have a certain amount of items in the raffle bots at once. Any item that has not been won and withdrawn by the winner is considered to be in the bots. For normal users the limit is 50; you can increase this by purchasing premium.